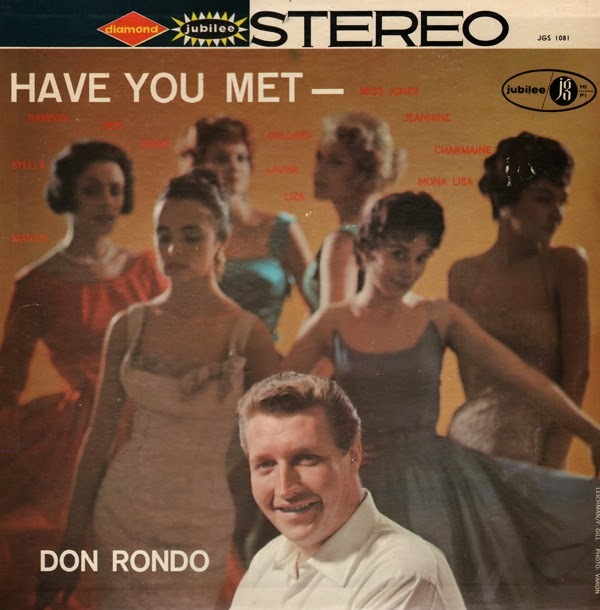 Have You Met Don Rondo? From the back cover: Don has been on the national vocal scene since "Two Different Worlds" His recording of that ballad put one of the first serious dents in the rock-and-roll rule. It tempered the tastes of the teen-agers. It wafted him out and up from the local vocal scene for good. That local scene was not one that began and ended in snap-of-a-finger time. It encompassed the type of training and background and struggle that makes more likely the ability to absorb the knock of an opportunity and stay on one's feet. Don Rondo was raised on a dairy farm in Ware, Mass. That farm was where he was born, milked cows, gathered hay. Ware was where he went to school, sold milk, won local amateur singing contest that started his professional career. There is a you've-heard-one-like-this-before kind of story about that contest. During World War II, when two of his brothers were drafted, Don had to leave high school to work full time on the farm. Don like to sing while he worked. His parents, though they were not at all musical, had no objection. Then, one day, two grain buyers visited the farm, heard Don sing and entered him in that contest at the local Lion's Club. The winning of the contest gave Don a once-a-week radio show on WACE. That exposure got him work with local bands, gave him the necessary experience to gain him a spot with an USO unit that toured Europe. When Don was 17 he met Ida May Bousquet. Two years later they were married. Now they have three children – Ronald, Debrah and Gay. And they all have to eat whether Dan was singing or not. So, frequently, Don would work at anything to make "bread" – sometimes he worked as a farm hand, often he was a construction worker, most frequently he earned his keep as a plumber. Always, there was the singing career and the club-dates, etc. to keep it going. Then came a chance meeting at a New York rehearsal hall – a meeting with singing comedienne, Fay De Witt. She was working on a CBS Radio Show called "Young Ideas." She liked the way Don sang, introduced him to her producer. So Rondo joined the cast… and the national vocal scene. From November 17, 1958 Billboard: Don Rondo's following in the singles field should assure this package of sizable sales. The warbler sings with verve on a group of swingy arrangements of oldies with girl's names as titles – "Liza" Stereo tag isn't important here. Jocks should play both versions. Cover is marred by unflattering photo of Rondo. From the back cover: Hamp's new vibraphonic excursions into form and instrumentation have always been interesting and dynamic, never without logic – often complexly logical – intention. Take his Golden Vibes (CL 1304, CS 8110, Stereo), for instance. Here, the musicians were divided between rhythm and reeds. The most memorable work-outs, probably, on that record were The Nearness Of You and The High And The Mighty, with Hampton caressing his vibes, and then heating them near to the melting-point. From October 9, 1961 Billboard: Here's a lushly orchestrated package of melodic mood music with a tasteful jazz flavor. Blending his standout vibe solo work with sweet strings, Hampton provides rich, listenable instrumental treatment of "Deep Purple," "Once In A While," "Ruby." and other dreamy oldies. The arrangements are not "cutting edge" by early 60s standards, although the arrangement on The Blues I Got Comin' Tomorrow does including a "thumping" bass effect which causes this track to sound "out-of-place" in the set. The majority of the set is one if the better "lush-strings" albums I've collected. 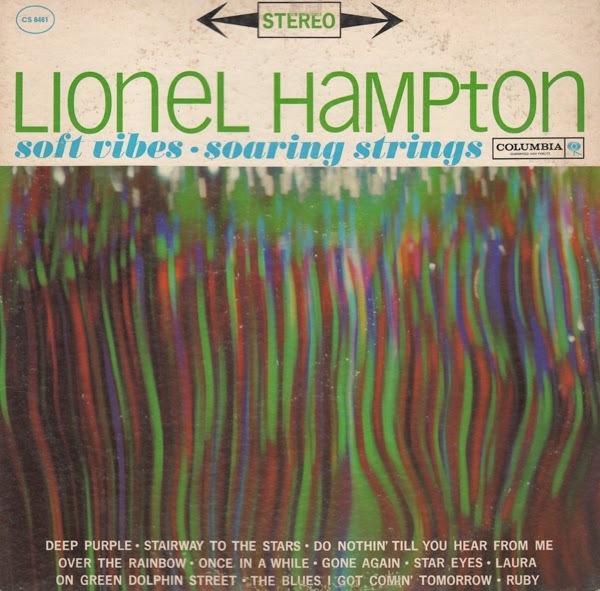 The strings blend nicely with Hampton's vibes and the "light jazz" influences help keep the music sounding fresh today.